Derek Burney has extensive experience in business and the public service in Canada. He served in the foreign service in Japan and as Ambassador to Korea and to the United States. 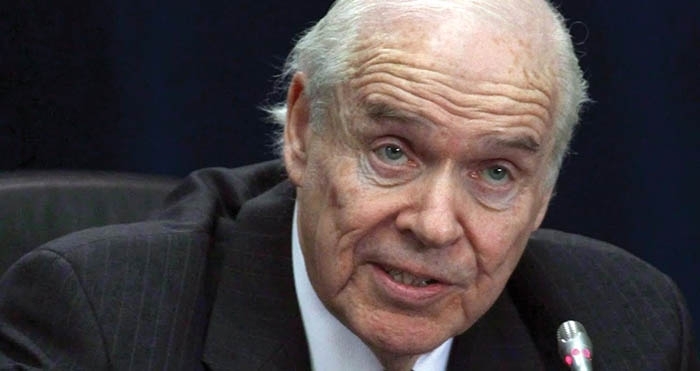 He served as Chief of Staff to Prime Minister Brian Mulroney and negotiated the first Canada-U.S. Free Trade Agreement. He served as CEO of Bell Canada and of CAE Inc., and has served on the boards of CanWest Global Communications, Quebecor World Inc., Shell Canada and TransCanada Corp, New Brunswick Power and Paradigm Capital. World-Spectator Editor Kevin Weedmark spoke with him last week regarding the town and RM of Moosomin’s efforts to restart the conversation on Energy East. You started speaking out about the need to look at Energy East again in August. What prompted that? Well I think it was prompted in part by the spat with Saudi Arabia. It looked like we were in for a rough patch with the Saudi Arabians one way or another pulling their students out and everything else. They seem to take for granted that we are a fairly substantial and reliable market for their oil. I have to confess I’ve been attracted to the notion of a pipeline like Energy East that would reduce our dependance on foreign oil since long before TransCanada even thought of building the pipeline. It’s just something that made sense to me as in being a national interest. If you were to break it down, what are the main reasons you believe it really makes sense? I think, just from a pragmatic standpoint, I think reducing our dependence on foreign oil has an advantage that makes us completely in control of our own energy resource. Since we have a surplus I can’t see a reason why we should be importing six or seven hundred thousand barrels of oil a day from outside of Canada and paying world prices for it. The second advantage is having multiple markets and getting world prices. Having only one market for our oil, being locked into the U.S. as our only market, means we sell our oil at a sharp discount to the world price, because if they know they are the only buyer they won’t pay world prices, so we are receiving a discounted price by the order of 30 or 40 per cent sometimes depending on the world price. That just didn’t make any sense to me and I think we definitely need pipelines to tide water. I don’t think it just has to be Energy East, I think we need TransMountain as well, but as you know, TransMountain even when it has become nationalized it’s not without its own problems. The reality is none of the pipeline projects are moving with any great speed in our own country which is why companies like Enbridge and Trans Canada are increasingly looking elsewhere to spend their money. I think that’s unfortunate, too, because on top of the market advantage of serving ourselves and having a capacity for export, a pipeline of this magnitude would create jobs. Unless you are a tenured professor at a university somewhere, the idea of generating jobs for Canadians has to be of paramount consideration not just for politicians but for our society. I just think there are a lot of pragmatic reasons for doing something like this. We don’t often do ambitious things in Canada but when we do them we get them done right. We should take another look at Energy East. Energy East, as I’m sure you know, died because of an overload of regulatory morass. The project was beaten down by regulatory overload to the point where almost a billion dollars was spent on the regulatory process itself before any pipe was laid, which I think is an unfortunate development, and I think it’s an indication of the degree to which we have become unattractive as a source for substantial energy investment and what have we seen. What we are seeing is a huge spike in oil moving by rail cars. You don’t have to be a citizen of Lac Megantic to know what the risks are of that. If you are an environmental purist you should know that the emissions from the railroads are far in excess of those a pipeline would ever generate, so I think there are all different types of considerations why the idea still makes sense. I have no illusions that the regulatory environment in the country is any better today than it was when TransCanada walked away from Energy East and Bill C69. The people that ultimately make the decisions on pipelines are the shippers, not the pipeline builders, because you need a commitment from the shippers before you can launch the building of a pipeline, but I have to believe that over time there is a need for a pipeline both to the west coast and to the east coast in addition to Keystone XL. It is a question of sequencing the pipelines in an efficient, economic order. What has changed in our regulatory process that these things are getting bogged down? There were two things that happened with Energy East. One was Quebec insisted on a separate environmental process and the federal government was reluctant to exercise its interprovincial authority over Quebec. Step one would be to assert that so that we don’t have to put up with individual provinces getting into the act and doubling or tripling the degree of environmental studies that need to be conducted. The first step would be for the federal government to stand up and declare that it has the authority to approve an interprovincial pipeline and step two would be to propose or offer a regulatory process in terms of time and money that is rational in order to get the project considered. The regulatory process itself had become so costly I think TransCanada wrote off upwards of a billion dollars on this project. At a certain point, the board and the management on behalf of the shareholders came to the conclusion that with the additional regulatory measures that the government was proposing in the middle of the game it just wasn’t worth it. Now the government takes the position that this was a business decision taken by the company because of the low price of oil—well that’s a pretty transparent umbrella to shield you from the rain but that’s the position the government takes. How do you see this current government’s approach to pipelines? Well, they are spending $4.5 billion of your and my money. I certainly hope they are more committed to TransMountain than they ever were to Energy East. They were never really supportive of Energy East, they were never really supportive of Keystone XL, and when the Obama administration rejected Keystone XL you didn’t hear any comment from the government in Ottawa, not one, not a peep, they just took it on the chin. Of course when Mr. Trump came along and approved it, everybody was happy to take credit. How realistic do you think it is to think that there may be a chance for Energy East to go ahead again at some point, and what do you think would have to change to make that a possibility? Well, if the federal government is going to nationalize a pipeline to the west coast, maybe they should consider nationalizing one to the east coast. If the only way we’re going to get transcontinental pipelines built in this country is for the government to do it, then let the government do it. I’m not predicting that any private sector company is going to take on the responsibility, because the regulatory regime is still opaque. I think the box the government got itself into was this aspiration to get social licence. In other words if they spent enough money on indigenous communities, if they spent enough money on the environment and made enough commitments like the Paris Accords on the environment they thought that they could bring the major opponents of pipelines around to accept the need for pipelines because of the importance of developing our own resource for our own well-being. That is a mistake in philosophy. As Rex Murphy very eloquently said a couple weeks ago in the National Post, you cannot placate the implacable. You cannot satisfy those opposed to fossil fuels. I’ve met them in various settings. You cannot have a sensible discussion with someone who is unalterably opposed to the development of any fossil fuel, but when you ask them how they got to the meeting they say they came by car. You ask what fuel they are using in their car. I haven’t met too many who are doing it with electric cars and even if they are you then say well where do you think the electricity is coming from? Is it coming from the sky? No it is coming from gas or coal or diesel or maybe nuclear in some cases. If you look at the International Energy Agency’s predictions for the use of fossil fuels going forward to 2040 you will see that 80 per cent of the energy by the year 2040 will continue to be coming from fossil fuels. Yes renewables are growing but when you start at zero and you get to one per cent, going from one to two is actually a 100 per cent increase. Renewables by 2040 are going to be less than 20 per cent of the total despite all the subsidies that there have been from governments at various levels to stimulate more and more renewable energy, and I’m just looking at what experts say. Oil and gas and even coal in places like India and China are going to continue to be a source of fuel for the foreseeable future, and I think to put our head in the ground and presume that the world is going to become free of fossil fuel in the near future flies in the face of the evidence that’s available. Do you think there is or could be the political will in this country for a project like this? I think it was discussed at the Conservative convention in Halifax. The government of New Brunswick is even more enthusiastic for it now than ever. I know the government of Saskatchewan has always been supportive. The problem had been Ontario and Quebec. The opposition or the weak support in Ontario, Quebec and Ottawa. If Ottawa would step forward you’ve already got Ontario and Quebec with new governments. Ontario, Quebec and Ottawa working together, along with the western provinces, we would get some national cohesion on this project. That is what has been missing —national cohesion. Where do you see that problem come from? I would never say lack of leadership, but I would say you get remembered as a government in Canada if you get the big things right, not if you do a lot of the small things right, and this is a big thing, whether it comes this year or next year or the year after. I hope we’ll see a leader with a kind of vision that will do something that is patently in the national interest, and a pipeline to each of our coasts certainly fits that description. We talk about trade diversification—we even have a minister with that word in his title. How is he going to export beyond North America if we don’t have pipelines to either coast? How is he going to take advantage of the huge economic growth like countries in China and India if one our strongest natural resources cannot be exported to those countries. I don’t think it’s rocket science.